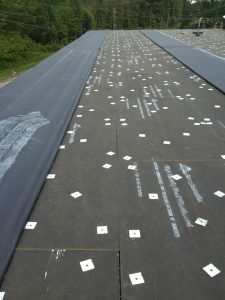 No one wants to have to deal with commercial roofing problems. What if we told you that you didn’t have to. There are some who would tell you that roofing issues are an inevitability, and that the sooner you accept that fact, the less you’ll have to worry about. To that, we here at the American Enviromental Services say “Hah!” Taking control of your commercial roof’s destiny isn’t some pipe dream; rather, it’s an easily attainable task, provided you have access to a provider of high-quality roof maintenance in Richmond, Suffolk or any of the other neighboring communities. Why Consider Routine Roofing Maintenance? Why should you consider investing in the annual maintenance of your building’s roof? For starters, the expense associated with frequent inspections may ultimately end up being much less than that of a costly repair project. Plus, you no longer have to worry about employee productivity concerns due to potentially unsafe or uncomfortable conditions. Finally, keeping up on the upkeep of your roof ensures that you’ll get the most years out of it. Just imagine the impact of having to slow or even suspend your company’s operations could have on your bottom line. Now think of the advantage of never having to worry about that could provide. Such a benefit could be yours by turning over the care and upkeep of your building’s roof to us here at AESC. To discuss the specific details of our roofing maintenance program, call us at 1-804-306-1044. You can also reach us by filling out our convenient online contact form.